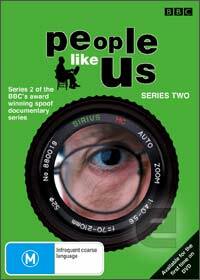 The modern classic TV series (series 2), finally arrives on DVD with People Like Us Series 2 that is the acclaimed BBC series that takes the "Mickey" out of society with its mockumentary approach. Director and writer John Morton is joined by Chris Langham who target a different profession each week in an attempt to show that these people are "just like us" and nothing is taboo for Morton who includes a Vicar, Mother and even an airline pilot. What starts as a serious documentary soon turns into a disaster as one cannot help but laugh their way through the embarrassment and anecdotes which makes this series a modern classic. This DVD contains all six episodes from Series 2 that is a first class comedy experience.